Like an athlete trailing behind a doping Russian, sometimes there’s no shame in finishing second. That should be the mindset for Peterborough United’s players and staff this morning after giving Blackburn Rovers one of their toughest matches for some time. Rovers’ last three league away matches read 4-2, 4-2, 3-0. They have now scored 16 goals in their last five league matches, with another three in the cup in between. Their central defender (Charlie Mulgrew) has scored five goals in four games, the striker they brought off the bench (Danny Graham) against Posh once cost £5 million, and one of their central midfielders (Peter Whittingham) was until recently one of the best players in the Championship. Throw in an on-loan Leeds United striker (Marcus Antonsson) who moved to Elland Road for £2 million last year, and a proven top League One performer (Bradley Dack) and compare it to a team which has mostly been compiled from the lower echelons of the football league and below, then it is to Posh’s credit that they competed so well for long periods against a Blackburn side destined for a quick return to the division above. But what yesterday’s (Saturday, December 9) result did was emphasise Posh’s areas of concern. As highlighted by Alan Swann in this week’s Peterborough Telegraph, Posh have a spine which is good enough to compete with the top of this division. Good goalkeepers, solid defenders, a midfielder rock in Anthony Grant, goal and assist machines in Jack Marriott and Marcus Maddison and the class of Gwion Edwards. But no central midfielder has scored yet for Posh this season, and even with three of them playing against Blackburn that never looked like changing. Jermaine Anderson was substituted in the second-half having failed to make an impact, and Chris Forrester - after showing glimpses of his best form - lost possession in his own half, allowing Dack to put Blackburn in the lead. The right-back position also continues to be a concern, and Jack Baldwin never looked at ease against the trickery of Craig Conway - who he was booked for fouling right at the start - or Antonsson. Baldwin has played as a central defender for most of this season, and his second yellow card in the final few seconds for a foul on Dack means a likely recall for Alex Penny. Another concern is up front. Marriott’s 95th minute tap in from a Danny Lloyd cross was his 15th goal this season, but even when Posh were 3-1 down, manager Grant McCann decided to bring on a central midfielder in Michael Doughty ahead of striker Ricky Miller. Idris Kanu made a belated appearance at the end, but only after midfielder Grant was injured. As McCann noted after the match, the substitutes have failed to make an impact this season. But more than anything, a narrow defeat against the division’s form side only re-enforces how disappointing Posh have been against the team’s lower placed teams. A performance like this against say Gillingham or Oldham would surely have resulted in points, and the gap to the play-offs would not be six points. If there were positives to take after Posh slipped to 10th in the League One table, they largely came in a late rally in the second-half when they tried to overturn a two goal deficit. Substitute Lloyd appeared to be tripped in the penalty area, but nothing was given. The forward also headed over when well placed, while Marriott could only direct Maddison’s excellent cross too close to Blackburn goalkeeper David Raya. In the end, Marriott’s late strike was a deserved reward for Posh’s persistence. Things had looked much better at half-time thanks to Steven Taylor’s back-post header from a Maddison inswinging corner. The goal capped off an exciting opening 11 minutes, which had seen Dominic Samuel wastefully plant a header over from six yards for the visitors, while Dack had twice come close to giving Rovers the lead. Posh goalkeeper Jonathan Bond saved well from the attacking midfielder, before a combination of Bond and Baldwin blocked the follow-up. Posh had also looked lively before the goal and played some good football after taking the lead, but Marriott and Edwards could not find the target from distance. Unfortunately things unravelled quickly after half-time. Mulgrew bundled in a flicked-on corner three minutes into the second-half, then Forrester’s mistake was capitalised on by Dack, who played a one-two with Richard Smallwood before sweeping in. Worse was to follow on 58 minutes, with Taylor losing the ball by the corner flag after a Posh corner. Quickly the ball was worked forward, and after bypassing Baldwin, a rapid counter-attack saw Samuel work the ball to Antonsson who played in Dack to fire home emphatically. Things could have become worse had Bond not made a superb diving save to deny Antonsson later in the half, before the late Posh rally came as Blackburn eased off. 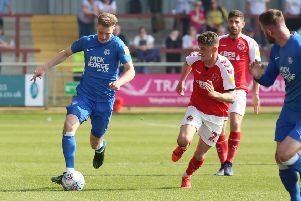 After a mid-week FA Cup replay against non-league Woking, next up for Posh are Fleetwood Town who haven’t won in six league matches, and Bury who sit bottom. And if Posh want to keep pace with the play-off contenders then second best will not do. Kanu, 86 mins), Chris Forrester (sub Michael Doughty, 72 mins), Gwion Edwards, Marcus Maddison, Jack Marriott. Subs not used: Connor O’Malley, Ricky Miller, Alex Penny, Lewis Freestone. Tomlinson, 46 mins], Marcus Antonsson, Bradley Dack, Craig Conway, Dominic Samuel (sub Danny Graham 77 mins). Subs not used: Jayson Leutwiler, Elliott Ward, Paul Caddis, Joseph Nuttal.